Verein Deutsch Drahthaar: Verein Deutsch Drahthaar, our parent organization, is the breed organization dedicated to the development, breeding and continuous improvement of the versatile hunting Drahthaar. Jagdgebrauchshund-Verein/USA: This is the North American chapter of the German hunting dog testing organization JGHV. Jagdgebrauchshund-Verband e. V.: JGHV is the umbrella organization in Germany for all of the versatile hunting dogs. It provides the test regulations, authorizes the judges, and maintains the test records for member breed clubs, including VDD. 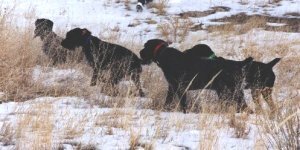 BirdDogsForever.com: The most complete listing of kennels that raise bird hunting dogs and the most complete listing of places to go hunting with them.